It’s that time of year again: the week after E3, and time for me to go over the numbers and media coverage from the show, as per tradition. If this the first time for you, please fee free to have a look at the methodology used, and read the blog posts for 2015 and 2016. First, looking at the biggest players at E3, the console manufacturers, in many ways this was an interesting year in light of their performance at previous E3’s. 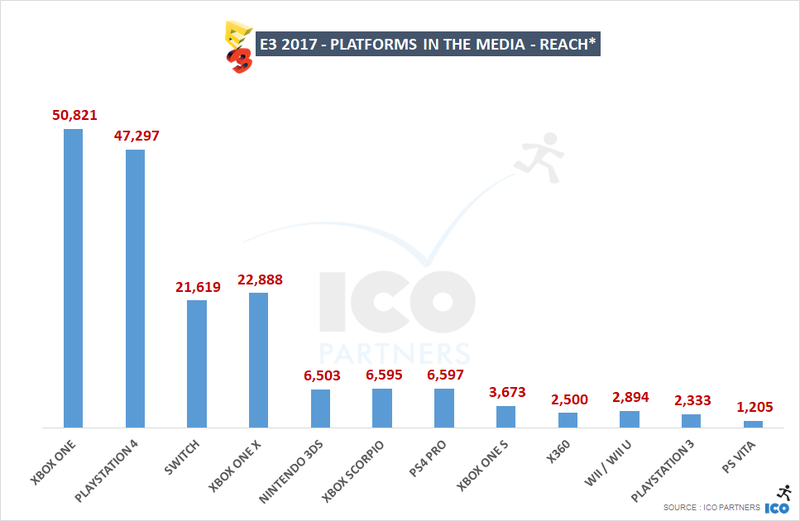 For the first time since we started measuring media coverage at E3 in 2014, Sony is not leading. It has to be said that the gap between them and Microsoft is very small, but this comes on the back of Microsoft growing for the 4th year in a row, and where Sony had its 3rd best performance out of 4 companies (on the back of its best performance last year). Nintendo, on the other hand, has had its best E3, doubling the coverage they got last year. The Switch is clearly a commercial success and is also popular with the media. With a smaller lineup than its competitors, it is quite the performance for them. The wider 3rd party program, with Ubisoft’s partnership at the forefront, is likely a significant contribution. Microsoft. It was their best E3 conference to date, as far as I am concerned. They finally hit the right tone in their announcements. However, nothing they have announced is really pushing the Xbox consoles over their competitors. Not many exclusives that would drive someone to pick an Xbox over anything else. The Xbox One X, if anything, is a console for the convinced customer, the one already in the ecosystem. Sony. The conference wasn’t mind-blowing, and the media coverage reflects this, but I think Sony was just playing it safe. There have been enough PlayStation exclusives to come out ahead of the show to allow them to message the console as the better alternative in terms of catalogue. The numerous VR games shown was a great reminder of the PlayStation VR, a strong differentiator when compared to other consoles. My biggest issue with the event was the format. It was hard to understand if the pre-show was meant to be considered as part of the main event – and many of the more interesting projects were revealed there. I will also note that during the show, the dates of this year’s PlayStation Experience were announced. This is a strong message that PSX is becoming the main press event for Sony, and I wouldn’t be surprised if they’ve held back a number of high-profile announcements. Nintendo. The numbers are quite telling – this was the best E3 for Nintendo in years. They were coming off of the back of an excellent launch for the Switch, and announced a number of high-profile games that are coming out very soon for the console. In terms of short-term hype, this was brilliantly executed. I am still somewhat confused by the Pokemon and Metroid Prime 4 announcements – they are likely to hype a core fanbase, and have the risk of setting expectations beyond what is being developed. I find announcements of this type are better done with something to show in order to frame what is being put together. But who knows with Nintendo? They may well knock these titles straight out of the ballpark. The Switch got more coverage than the Xbox One X last week – which is impressive considering the higher profile of the Xbox brand. Also impressive: the 3DS is still getting a decent amount of coverage. The main point to consider, looking at the reach of each console, is the fact that the Xbox brand seems to be very good at getting covered by higher profile media. The short lead the Xbox One has over the PS4 is translated to a more significant lead in reach. 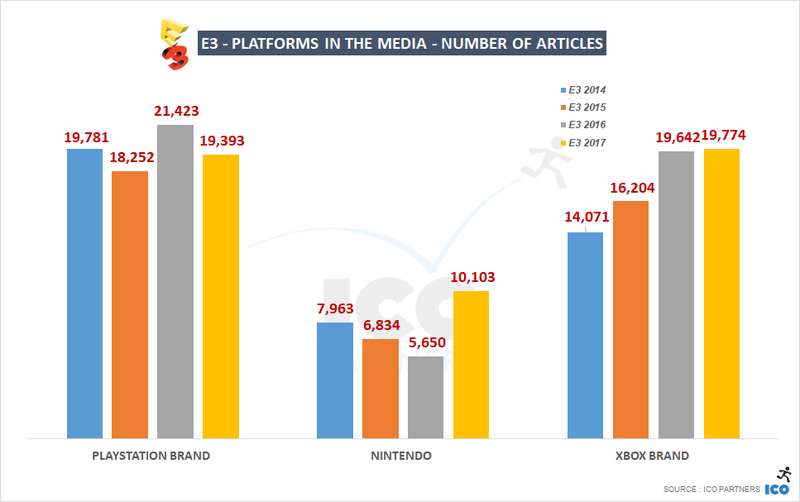 And the Xbox One X, being slightly behind in terms of the number of articles compared to the Switch, sees a significant lead when considering the corresponding reach. Finally, I wanted to check the VR device coverage, to compare it with last years. Again, PSVR is leading. But, there were about half as many articles as at last E3. That’s a steep decline, most likely due to the fact that the speculation on VR is now in a different phase, with all the devices on the market and being known quantities. 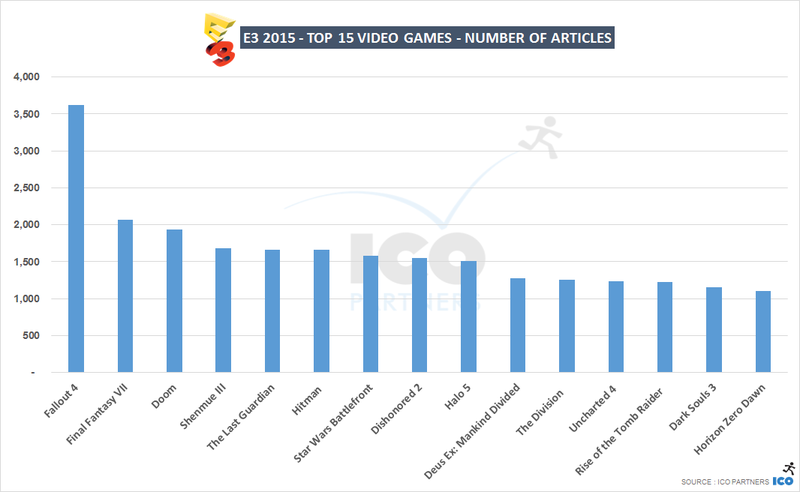 Like the previous year, I looked at the top games based on the volume of media coverage. [This was what was initially written in the article] EA didn’t do as well as last year. At that time, they had two games that had more than 2,000 articles. This year, Anthem, their best performing game, doesn’t reach that threshold. It’s interesting to note that Anthem is the only newly announced IP on the list. 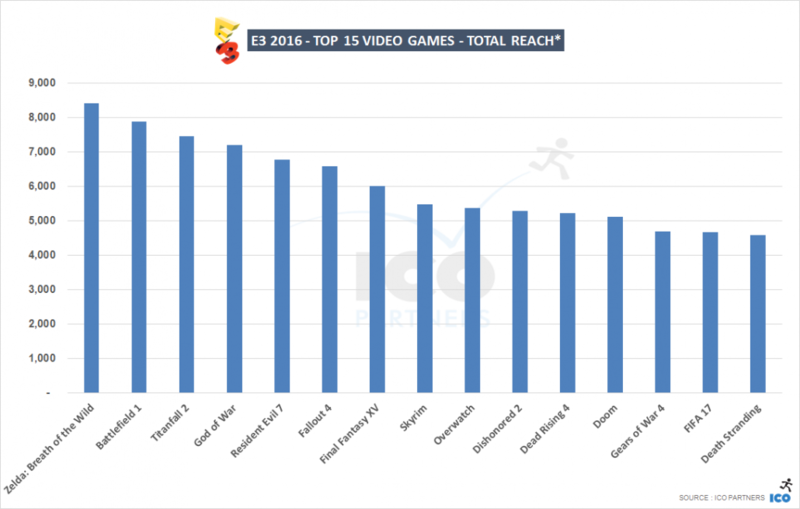 Assassin’s Creed Origins is leading for a number of reasons: the game was featured significantly at 2 press events (Microsoft and Ubisoft) on top of being playable at E3. Skyrim is marked with an asterisk because it featured in a few different capacities: the Switch Port during the Nintendo conference, the PSVR port during the Sony conference, as well as the fact that the next expansion for Elder Scrolls Legends is featuring Skyrim. This means it’s more difficult than usual to point to this as a game singularly featured. With only one game in the 2,000+ articles category for coverage, 2017 is a year with weaker big game announcements than 2016 (which had 5 games in the 2,000+). It says nothing about the quality of the games of course – it is purely a statement of their media coverage. There were 3 publisher-powered press conferences this year, with Square Enix skipping it again this year. Ubisoft, after three years of growth, is finally coming on top, in large part thanks to the Assassin’s Creed Origins coverage. [This was what was initially written in the article] EA didn’t seem to manage to secure the right attention. It might be the EA Play formula that didn’t work as well as last year (a single location this time), it might mean the lineup didn’t catch the attention in the same way that last year did. It has to be said that FIFA 18 being a top game for EA this year isn’t actually a good sign, as FIFA 18 didn’t get as much coverage as FIFA 17 had last year. The most disappointing of all is the coverage for Battlefront 2, considering the power of the Star Wars brand and the release this winter of Episode 8. 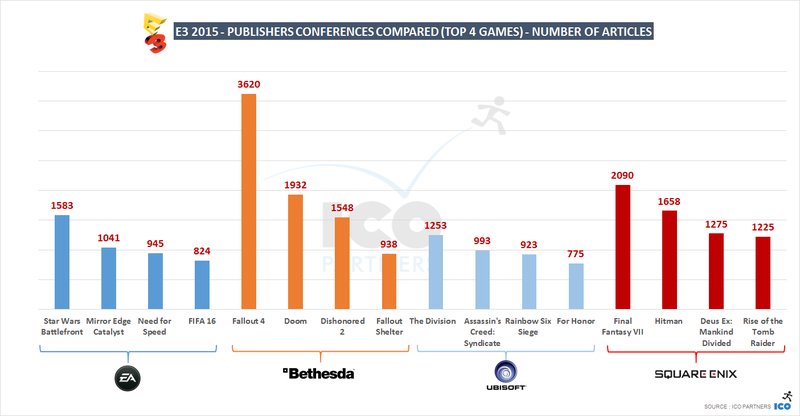 Bethesda did OK – the two new games obviously getting most of the coverage. But the really strong IPs of the publisher, Elder Scrolls and Fallout, had no revolutionary announcements around them, and in that respect, Bethesda still performed quite well considering. Finally, Ubisoft’s conference was praised by many attendees and analysts as the best of the show. It had a wide range or projects showcased, an unexpected number of new projects revealed. The lineup was very strong, and then Ubisoft also managed to throw a few curve balls. The fact that they’re going after the declining toys-to-life market with Starlink was totally unexpected, for instance. No short selection of games for this year’s case studies. Instead, I looked at how 2 games’ coverage evolved year-on-year, and how two games from Klei compared to each other a year apart. After its 4th year being featured at E3, Cuphead is finally going to be released. This illustrates quite nicely how much having a release date helps you coverage-wise. At this point, the game has been covered a lot over the years. 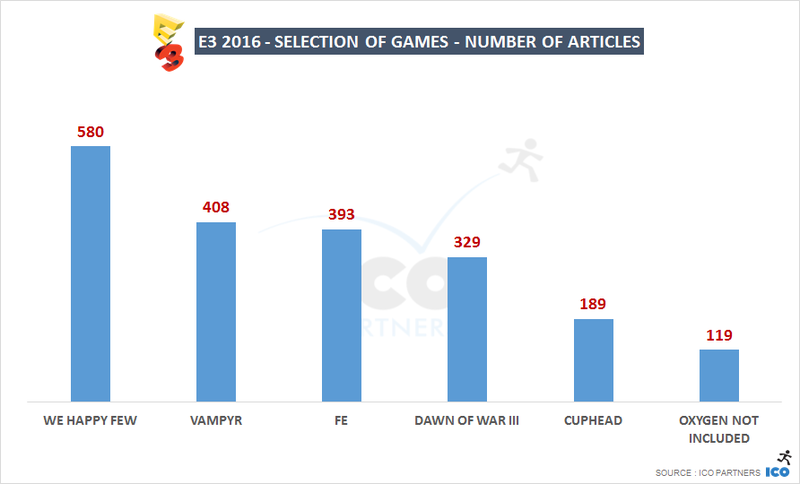 The fatigue shows through the numbers at E3 2016, so the 2017 numbers overall indicate a very good performance for a game of that profile. Its first year at E3, the game wasn’t featured at any conference, and it had a very decent coverage considering. Last year, it was featured during the PC Gaming Show, showing the significant visibility this smaller press conference can still bring you. This year is the last one before the game releases. The date has been announced, a feature video was released the previous week (and thus mostly absent in the numbers above), gameplay was at the center of the communication at this E3’s beats. A strong coverage overall, even if not in the range of blockbusters. These projects by Klei are very interesting to compare: they were both revealed at the PC Gaming Show. It is very difficult to get comparable data over time, but this is quite interesting – two games by the same developer, announced at the same conference at E3. I haven’t shared data over the PC Gaming Show in the past, and it is mostly because the branding is not as strong and many announcements get relayed without mentioning the event. The fact that a games media outlet is attached to the event as the organizer might play a significant part too. 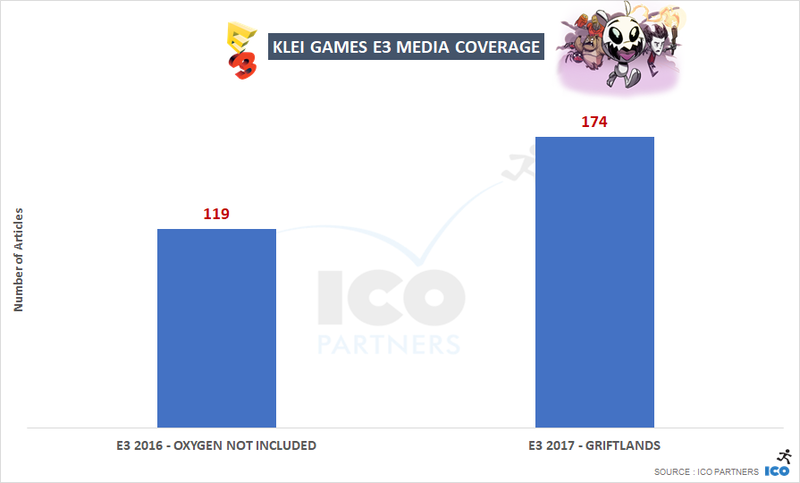 Anyhow, there is evidence of growth in coverage for games featured at this event, and Klei’s games illustrate this quite nicely. 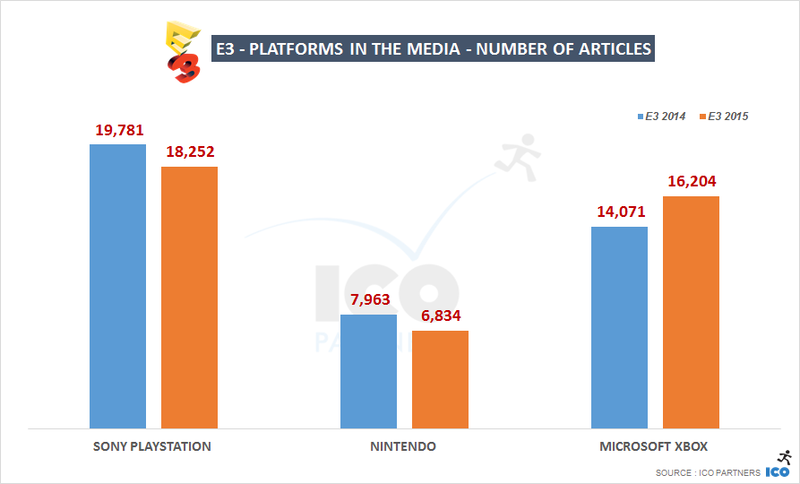 I have always felt a bit conflicted about titling these articles “Who won E3?” as there is much more to the data than that. However, this year’s E3 is a bit of an exception. The announcements made, the reaction of the media to them, the progress of the media coverage over the past few years; all of this make me want to declare two, very complementary “winners”. Nintendo – as they come back into the spotlight and significantly increase their media presence, this has certainly been the best E3 in years for them. Ubisoft – with their numerous announcements, the way they were orchestrated, and the stellar execution of the Beyond Good and Evil 2 trailer release, all explain how they ended up as the leading publisher of this E3 in terms of coverage. And I want to think that the two companies’ partnership also played a big role, and is probably not a coincidence considering the position they both have at present in the industry, and their respective challenges. Why Nintendo and not the Wii? In the graphs on consoles over the past 3 years, I am comparing the PlayStation and Xbox brands to Nintendo. The fact is that the other consoles have consistent brands whereas Nintendo machines are using multiple brands. Moreover, Sony and Microsoft are two companies with activities spread across multiple industries and cannot fairly be compared to Nintendo, when we look at articles on games. Nintendo is also a strong publisher, and its brand is more established than one of its consoles, compared to Sony and Microsoft. Comparing platforms to brands is the best way to have comparable results to look at the Nintendo brand, rather than the Wii for instance (or even a combination of the Nintendo consoles). What is the reach value? The following graph requires some pre-explanation. In order to measure the magnitude of an article, with have created a formula based on the websites’ Alexa ranking to give their articles different “weight”. The more popular the website, the more weight we give to their article. This value is called Reach in our tools and range from 0.1 to 10. For example, currently, Eurogamer.net has a reach of 10, Gamasutra.com has a reach of 8, Road to VR has a reach of 6. So what you see below, is a chart of the total reach of all the articles showed above. We refresh the reach values constantly. E3 is now over, the weekend has passed, the attendees have flown back to their homes, and it is time for me to go over the media coverage of the events, as is now traditional. If you are new to them, I invite you to first check on the methodology that we use, and then to have a read of last year’s analysis. This is the 2nd year where Nintendo as a brand is declining in the media coverage during E3. The lack of any hardware announcement where both Sony and Microsoft made one, and the format of their announcement that focuses on the online audience rather than to the in-person press conferences of its competitors means that the firm is losing out on mindshare with the media during the E3 week. 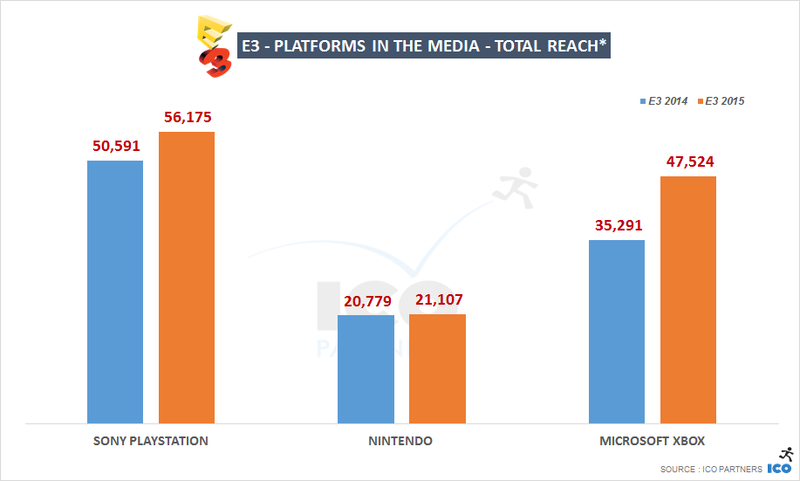 For Microsoft, this also proved to be an excellent E3, as for the 2nd year media mentions of their console brand has increased, taking it to the level Playstation had in 2014. The double announcements of the Xbox One S and the Project Scorpio with its promise of VR support were the strongest take-aways from their press conference. 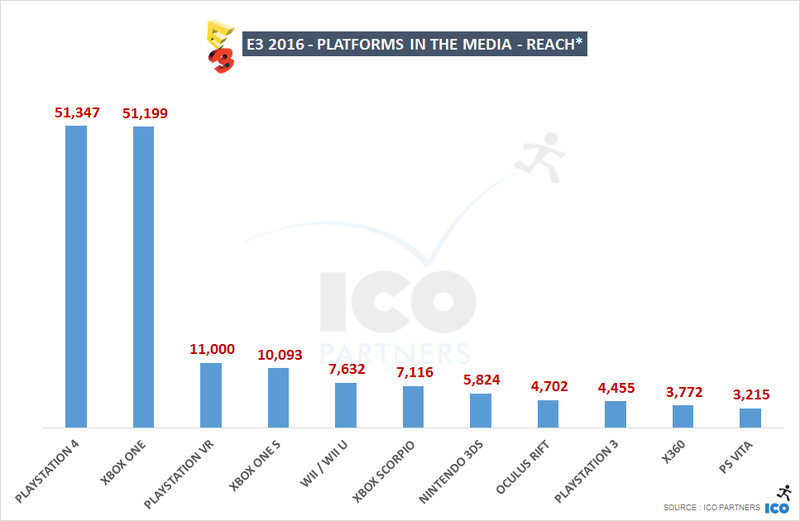 Again this year, the PS4 and the Xbox One are the two leading platforms in terms of media coverage. Interestingly, the Wii platforms and the 3DS have both declined significantly, the former more drastically so than the latter. A lot of this can be also be attributed by the significantly smaller support from 3rd party for the Nintendo devices, that rely on its own games for the majority of coverage. Looking at the reach (details on the method at the end of the blog post), the gap between the Playstation 4 and the Xbox One is a lot narrower. The generally higher profile of media covering the Xbox new devices is probably helping. 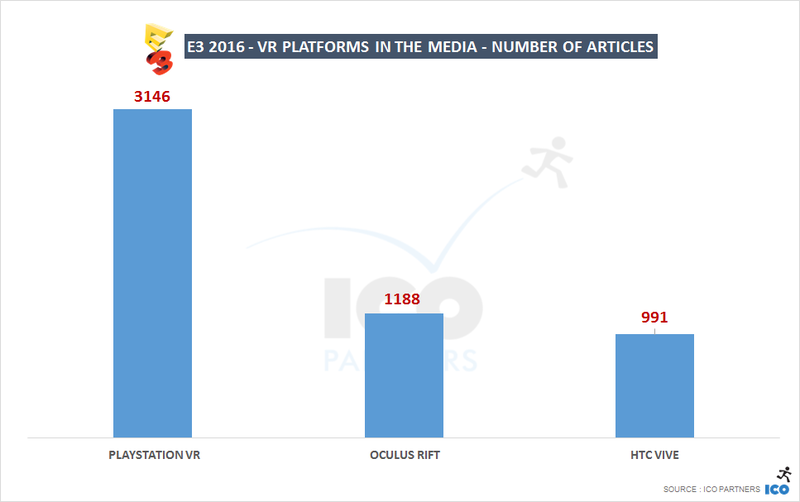 Another interesting difference is how good the Oculus Rift’s reach is compared to the number of articles. There seems to be a strong interest in VR devices from bigger media outlets. 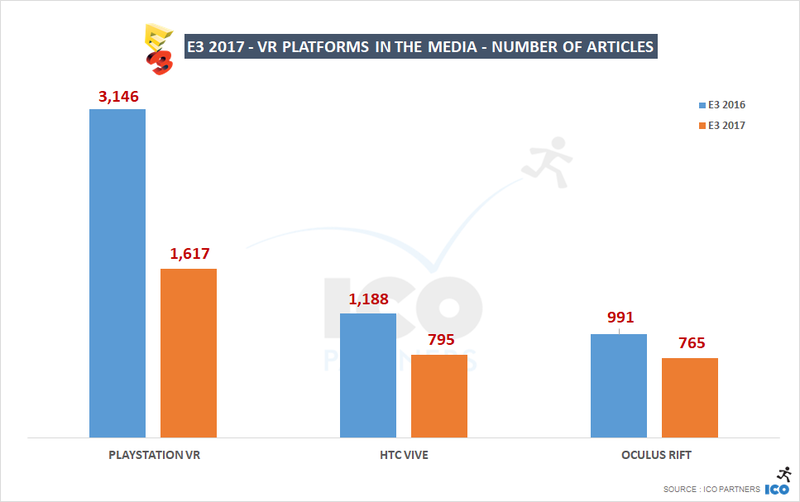 Looking specifically at the 3 leading VR tethered HMDs, the HTC Vive still got a significant amount of media coverage, through announcements made to support it (notably Fallout 4). Last week also saw a lot of controversy pitting the Oculus publishing strategy against the HTC Vive’s, probably feeding media coverage of both devices. Of course, the Playstation VR was at the heart of VR hardware news with a launch date and price announced. Following the format set last year, I have looked into the games that got the most media coverage, before getting into the ones specifically presented during the publishers’ press conferences, and then looking at interesting smaller case studies. There was no “Fallout 4-style” announcement dominating the media like last year. EA’s strategy to “not attend” E3 has paid off for them. They have the 2 games dominating the media that week. It seems like the notion from last year that going first gives you an edge might be true here as well. Despite Nintendo’s poor media presence, it has one of the most talked about games of the show with The Legend of Zelda: Breath of the Wild. By comparison, there were no Nintendo games in the top 15 ranking last year. Overwatch is still going incredibly strong (if you follow me on Twitter, it was the game with the most media presence in May), getting into these rankings without having any E3-related news. Looking at the reach of the articles on video games, it is impressive to see that the new Zelda has indeed caught the attention of the most influential media. In the same vein, whilst the new Hideo Kojima game Death Stranding didn’t have as many articles as the new PREY, the media covering it are overall bigger ones. There were only 3 publisher-powered press conferences this year, with Square Enix skipping it this time around. While Ubisoft had better coverage for its top titles than last year, it is still not doing as well as EA or Bethesda, both having been set prior to the console makers events. EA sees its two first-person shooters dominating the line up. 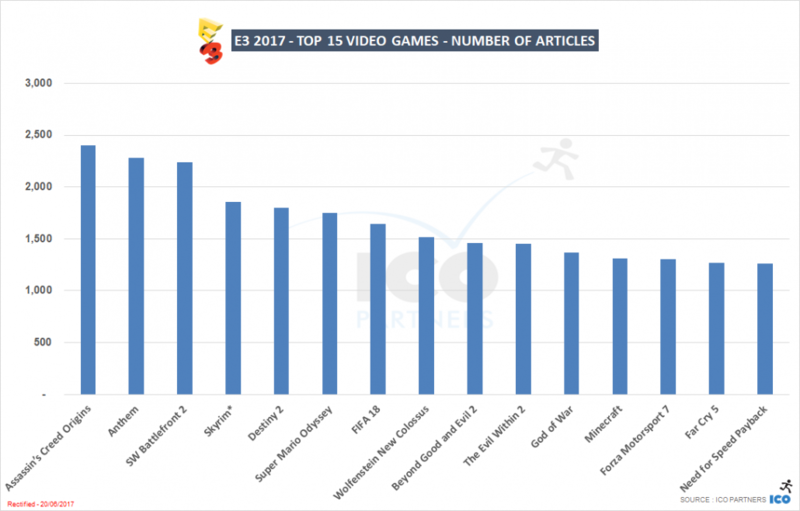 Whilst Battlefield is a known quantity, and it doing very well is not surprising, Titanfall 2 is a surprising 2nd as the most talked about game of E3. Another surprise is the how a sports title like FIFA, a genre that doesn’t usually get a lot of media to talk about them in comparison, has had more coverage than any of the Ubisoft titles for instance. The announcement of the story mode probably played a very strong part in this. And lastly, Mass Effect: Andromeda, despite having very little shown about it last week AND being an RPG, also not the biggest genre for video games, has performed remarkably well in the media. 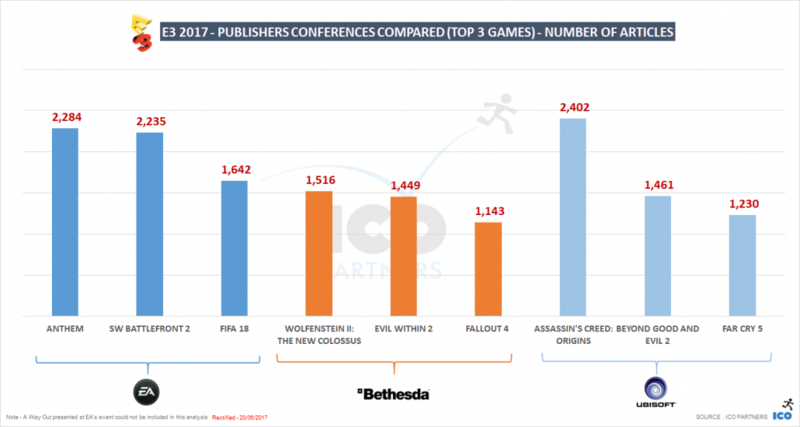 Out of the 4 most discussed Bethesda titles, only 1 hasn’t been released yet, and it had already been announced last year, showing an interesting trend for Bethesda’s games to capture the attention of the media beyond their launch – more so than the upcoming titles like PREY or Quake Champions. As for Ubisoft, Watch Dogs 2 is continuing to get the interest of the media following its recent reveal. The time allocated to For Honor during the Ubisoft presentation was significant, probably helping the game garner media coverage last week. The conference closer though, Steep, despite being set as the piece de resistance, wasn’t as popular as other games from the Ubisoft line up. All 3 companies with a press event are doing way better than all the other ones. Interestingly, they actually do more or less the same, the excellent coverage that Bethesda got for a few games being counterbalanced by the larger number of games that are present in the Ubisoft line-up, for instance. Looking at specific data points, I have selected a few interesting case studies to quickly present here. I mentioned it earlier, but FIFA 17 did much much better than last year’s iteration. We are talking almost twice the coverage from last year. The new key feature announced (the story mode) as well as the timing of the EA press conference are my two strongest theories as to why this is. We Happy Few. It was shown, on stage, during the Xbox press event. The game has never had so much coverage since it was announced (unsurprisingly), and despite the absence of publisher support, it is seeing more coverage than other games with such support. Vampyr. The new title developed by Life is Strange‘s studio DontNod, published by Focus Interactive, was featured during the PC Gaming Show and is probably the game featured there that had the most coverage. Fe. The successor to Unravel as the indie-title-being-published-by-EA. 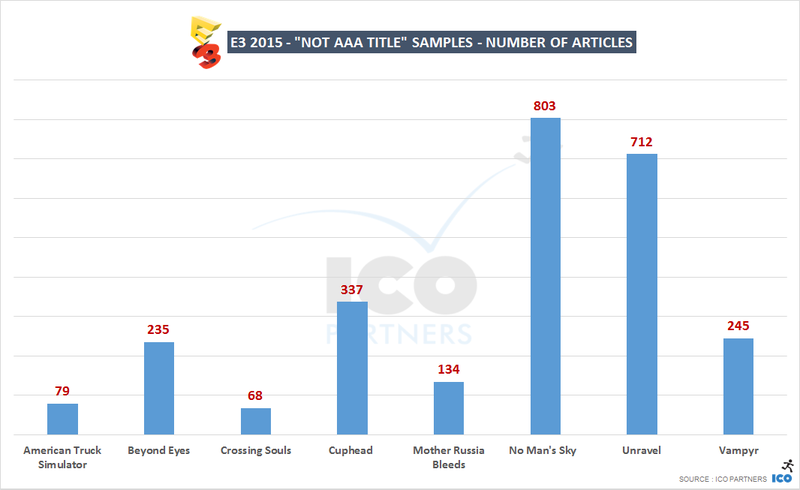 It didn’t capture as much media attention as Unravel though (700+ articles at E3 last year). Dawn of War III. Another game featured during the PC Gaming Show, published by Sega. It makes me think that Sega doesn’t put a lot of energy into E3. Cuphead. This was the 3rd year for the title to be showed at E3. Still getting quite a decent coverage, but not something in the same scale as last year’s. Oxygen Not Included. The new upcoming game from Klei entertainment (Don’t Starve, Shank), the game was one of the few games actually revealed during the PC Gaming Show. The coverage it got makes me wonder if the game might have done better in terms of coverage at a smaller event like PAX. 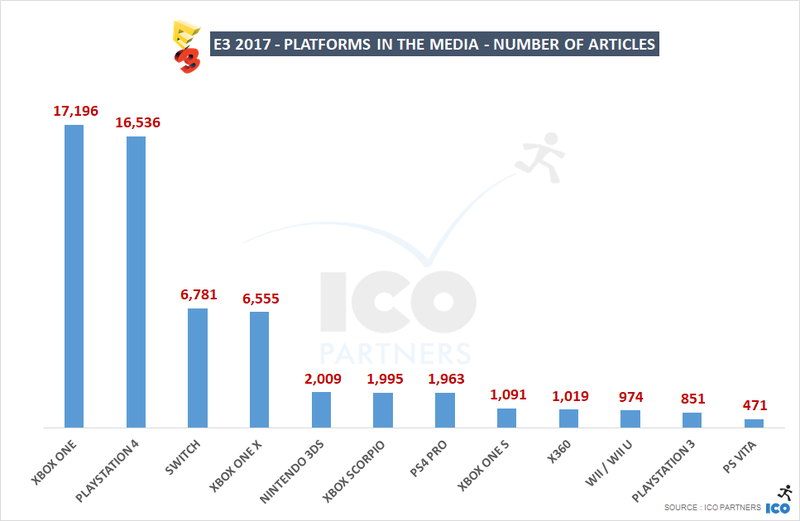 Overall, games that have strong infrastructures behind them (publishers mostly) have much, much better coverage at E3, as one might expect. With VR still being a strong topic at this year’s E3, I wanted to give a check on the VR games that were the most talked about during the week. 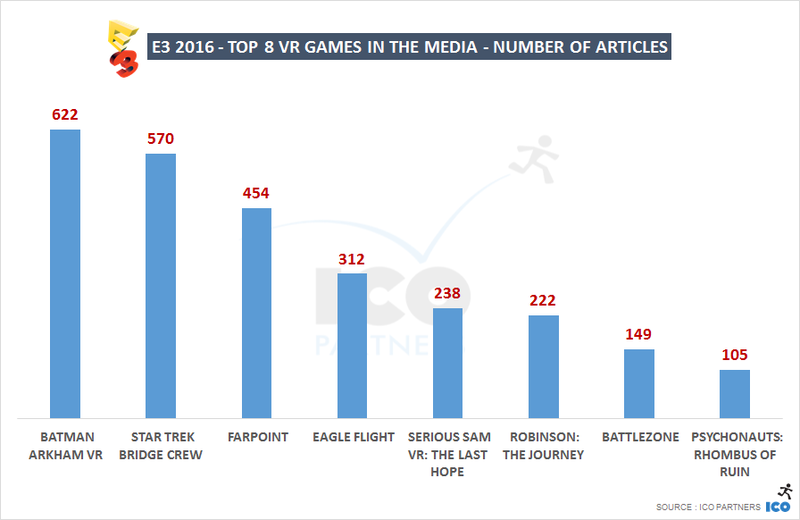 The two most mentioned games are both backed by very strong franchises, respectively Batman and Star Trek, maybe showing the path for VR to claw its way to the mass market audiences. All things considered, 2016 was a strong E3, although with much of the action happening on the periphery of the event itself, the “E3 show” as we know it is certainly changing. EA, running its event in parallel, actually came out stronger than it had in the past at the event. It might be a new trend starting, with the question of the role the show itself would play if more companies decide to piggy back on the draw it has with media during the week, without actually contributing to it. Would it work out at all without the support of the majority of large publishers? In the graphs on consoles over the past 3 years, I am comparing the Playstation and Xbox brands to Nintendo. The fact is that the other consoles have consistent brands where Nintendo machines are using multiple brands. Moreover, Sony and Microsoft are two companies with activities spread across multiple industries and cannot fairly be compared to Nintendo when we look at articles on games. 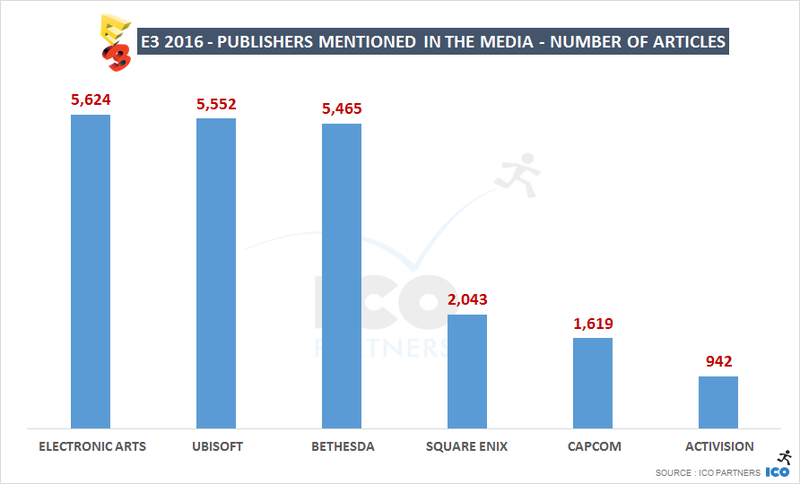 Nintendo is also a strong publisher, and its brand more established than the one of its consoles, compared to Sony and Microsoft. Comparing platforms to brands is the best way to have comparable results to look at the Nintendo brand rather than the Wii for instance (or even a combination of the Nintendo consoles). 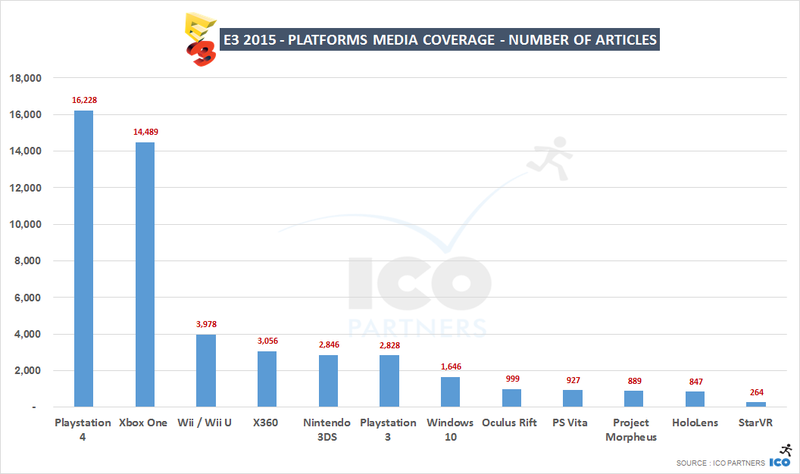 A year ago, I did a pretty extensive analysis of the media coverage around E3. Well, I have done it again, and it now benefits from the added experience of data tracking for the past 12 months. As usual, if you are not familiar with the way the data is collected, I invite you to read the blog post on the topic. 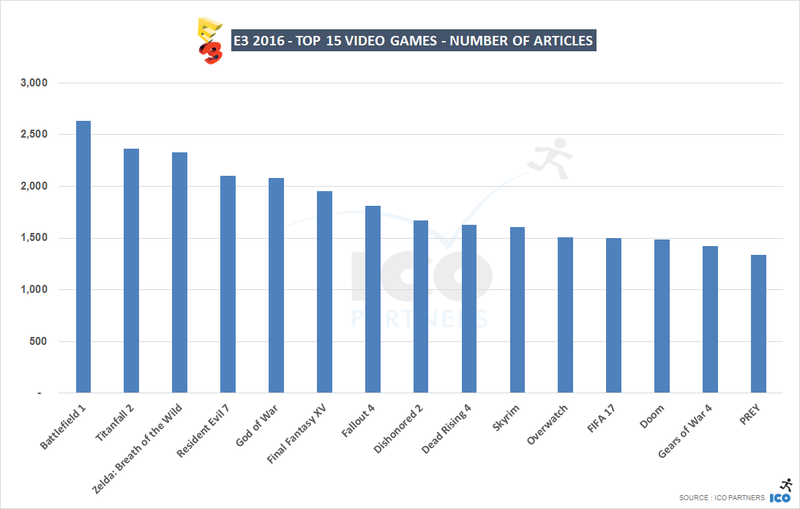 For the purpose of this article, I have only looked at the data from articles published during the week of E3 (from Sunday to Saturday). 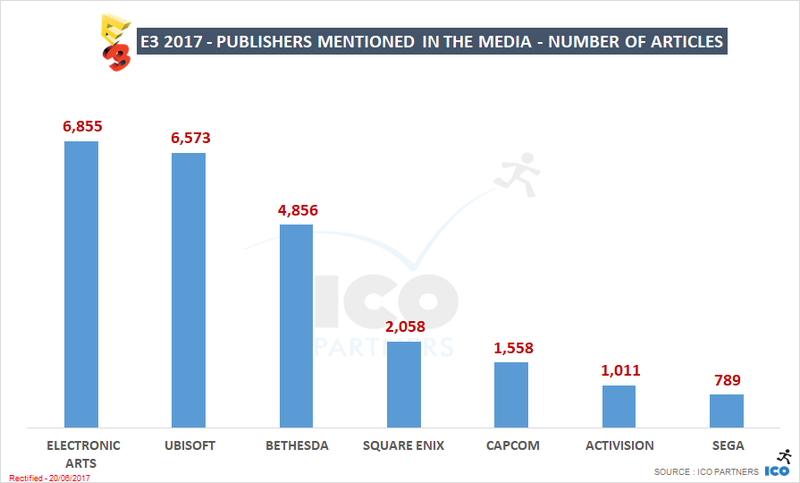 Last disclaimer: of all the games that were featured in the main press conference, we have one that is problematic to track with our current tools and which has been excluded from all the data below: Just Cause 3. Just keep this in mind, we haven’t ignored it, it is just a slightly problematic game for us at the moment. To get started, I wanted to get advantage of some information I didn’t have last year: the data from the previous year. Comparing the coverage year-on-year is an important indicator, one I wanted to check first. It is important to note that the number of media we properly track is constantly evolving – some websites die, some news ones emerge, and sometimes the websites break the way we track them, so the system for tracking articles is consistently improved upon. Overall, I think the pure volume of media we track is increasing overtime, but it is a rather slow increase. 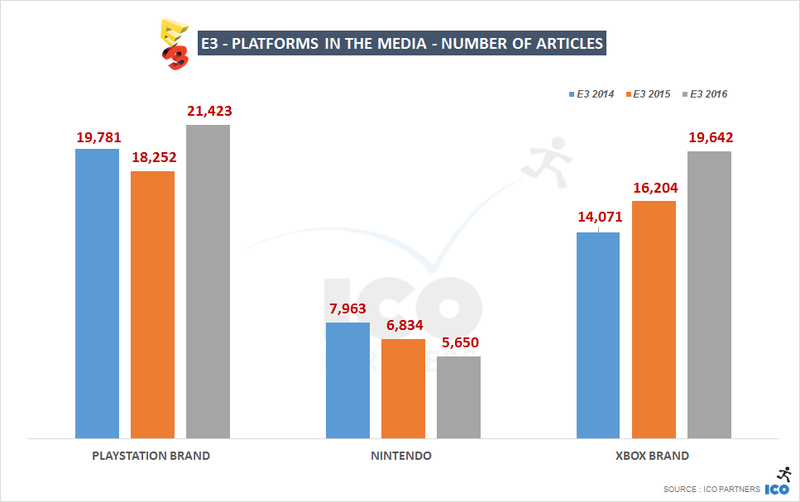 In terms of number of articles, we can see a decline for both Sony and Nintendo, while Microsoft has a significant increase in the media coverage. This might come from a stronger line up on Microsoft’s part or weaker showing from their competitors. We shall see later, but it might also come from a more clever selection of the multiformat titles featured for the respective conferences (well, between Sony and Microsoft as Nintendo is not invited to play that game). * The following graph requires some pre-explanation. In order to measure the magnitude of an article, with have created a formula based on the websites’ Alexa ranking to give their articles different “weight”. The more popular the website, the more weight we give to their article. This value is called Reach in our tools and range from 0.1 to 10. For example, currently, Eurogamer.net has a reach of 10, Gamasutra.com has a reach of 9, MondesPersistants.com has a reach of 2. So what you see below, is a chart of the total reach of all the articles showed above. We refresh the reach values constantly. The graph shows an interesting pattern. It shows that the media coverage might have reduced in volume, but the media covering the event have grown. It could be the websites have a better penetration than last year, or it could be more general interest media (that tend to have a much better reach) are taking a bigger interest in the video games news. It also shows this year wasn’t a Nintendo year, hardly maintaining its reach from last year when both Microsoft and Sony expanded. 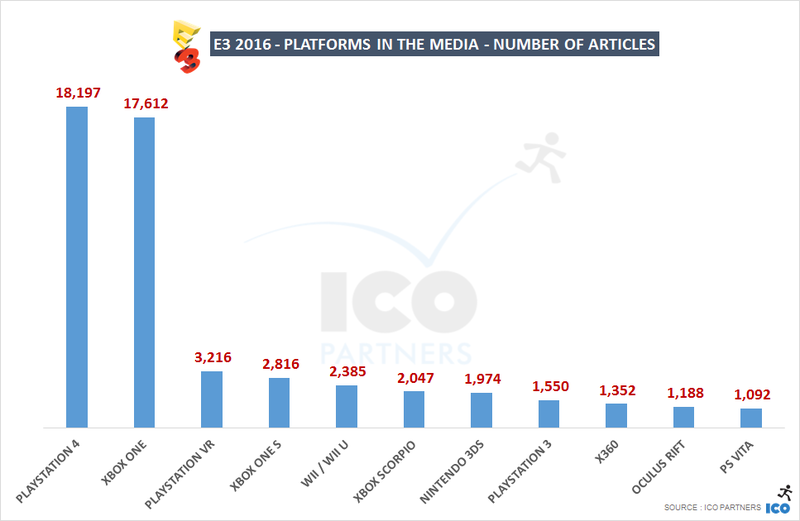 Leading the pack, the Playstation 4 has roughly the same volume of articles as last year. Xbox One saw a 25% increase in the number of articles mentioning it. The Wii U, the PS3 and the Xbox 360 are all seeing a decline. That’s understandable for the two “old gen” machines, but more concerning for Nintendo. On the front of the new technology, Oculus Rift (which had its own media conference the week before), Morpheus and Hololens are all holding up nicely in the same range. I added StarVR, newcomer to the VR scene, as they had just announced their existence and had a presence at E3. With 264 articles, and considering their lower profile, I think this is a good performance. I have kept things a bit simpler this year and avoided looking at the games as mentioned during the console makers’ conferences. They tend to bleed over the conference of the publishers and not provide much insight. I am going to experiment with the publishers conferences instead – especially as this year two new companies are trying themselves at this perilous exercise with Bethesda and Square Enix joining EA and Ubisoft. First thing to mention, all the games making the top 15 were featured during one or more of the media conference. Second thing to mention, FALLOUT 4!!! I have meant to write an article on the media coverage the announcement for the game had but couldn’t make it happen pre-E3. From the current research I made for that article, Fallout 4 announcement is the most covered game announcement since we track these data. By a large margin. But even with such a strong sign of the franchise power, I didn’t expect Fallout 4 to dominate by that much, especially after the storm of coverage that FF7 and Shenmue created. 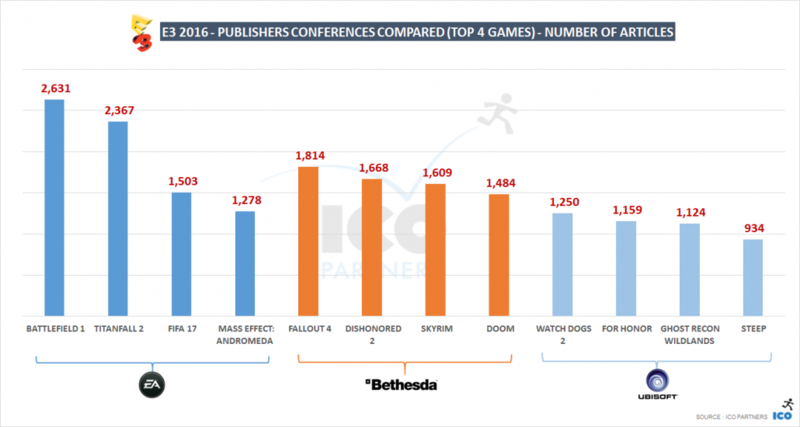 Bethesda had a brilliant timing and this helps a lot for their presence in that chart (Fallout 4; DOOM; Dishonored 2). By going first on the Sunday, with journalists all already present in LA and with nothing to do for a whole news cycle but write about their games, Bethesda snatched a great spot. Fallout also got double featured, at the Bethesda event as well as the Microsoft briefing. Looking at publishers one by one, Electronic Arts looks a bit underwhelming. Arguably, Battlefront did very well, considering how loved the franchise is (the movies and the games), it is a bit surprising it didn’t perform even better. It didn’t pass on the coverage Battlefield Hardline received the previous year, a surprising fact. Mirror’s Edge coming as the 2nd game of the publisher is more surprising. While critically acclaimed, Mirror’s Edge wasn’t a big hit. Few details were available ahead of the show (and seemingly not in a controlled fashion that might have compromised the potential) possibly making it a hot topic for journalists on site last week. 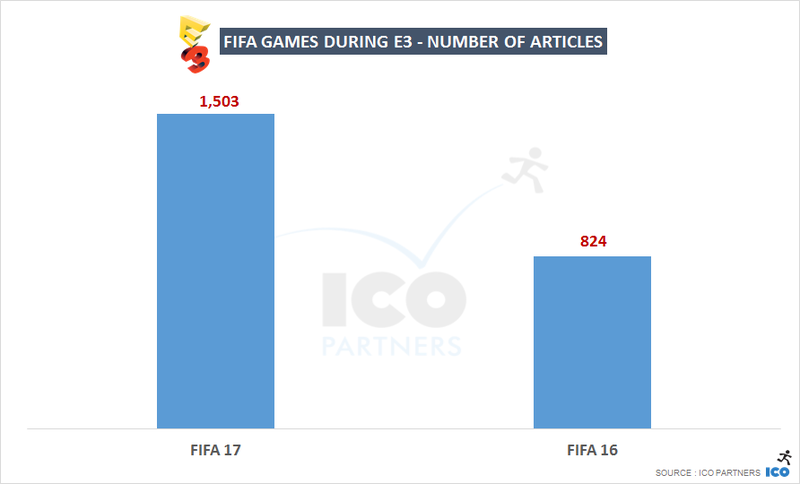 Interestingly, FIFA 16 has about 20% fewer articles this E3 than what FIFA 15 had last year. Pelé didn’t make up for it. Bethesda is the clear “winner” this year. They didn’t have many games at the show, but they got the interest of the media. While Fallout and DOOM are strong and well established franchises that haven’t been seen in a while, Dishonored 2 has done very well for itself. For the second title of a new IP, it received 50% more coverage than this year’s Assassin’s Creed. Quite the performance. The other surprise is Fallout Shelter. While Fallout is obviously a strong brand, mobile games are generally not as well covered as PC/Console titles by a very significant margin. Fallout Shelter is not only the 4th Bethesda most talked about game (coming before The Elder Scrolls titles as well as Battlecry), but it received coverage comparable to Ubisoft’s key titles. My theory is that it benefitted from a number of things: the Fallout brand; the 1st game on mobile for Bethesda; being available “right now”; the excellent Bethesda timing mentioned earlier. If you are a journalist in LA on the Sunday before E3, waiting for the big event to start the following day, why not download this now to give it a spin? I have already mentioned Ubisoft twice in this section, not in a very positive manner. What happened? To be honest, I like Ubisoft’s conferences. But maybe the formula is a bit too established? The Division‘s very decent performance is the saving grace, and a surprising one to me: this is not the first time the game is presented at E3. But it managed to garner more coverage than last year (about 10% more). Possibly, the fact it got featured during 2 of the conferences helped significantly? I imagine the game was playable on the show floor and that, along with a release date, was a contributing factor. Rainbow 6 Siege was also present at last year E3, and it also received more coverage this time around. Assassin’s Creed Syndicate is the disappointing element of the Ubisoft line up. Assassin’s Creed Unity had about 2,300 articles during last year show – compared to this, Syndicate doesn’t even reach the 1,000 articles threshold. I found the trailer quite compelling, I suspect something different happening in the strategy for the game this time around: looking at the daily data for the two games, it is obvious there was significantly more coverage on the days after the conference for Unity than for Syndicate. 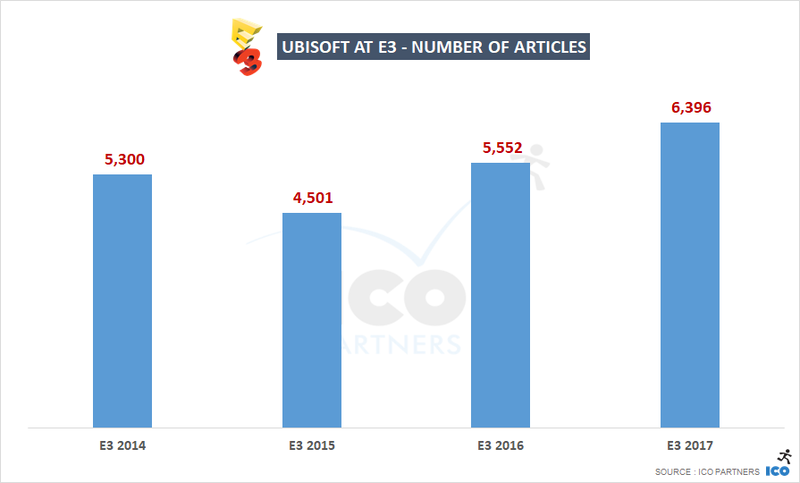 Overall, a weak media presence, especially considering that last year, Ubisoft had Assassin’s Creed Unity as the most covered game of E3 and Far Cry 4 as the 3rd most covered game of E3. To conclude this section, Square Enix returned as a publisher hosting a conference. It wasn’t an easy ride for them – they had to postpone their conference after realizing they would collide with Nintendo’s; and the conference itself was… let’s say there is a huge margin for them to improve for next year. But beyond those considerations, the numbers are showing up. Even if you are ready to consider the Final Fantasy VII as a unique anomaly (how often will you be able to reboot one of the most well-loved games in the world? ), the Hitman announcement has been very well received (arguably, I think the Deus Ex announcement in April was a better announcement, but that will be for its own case study). Deus Ex Mankind Divided did very well. It was supported massively by the 20 minutes demo on the show floor – a video of which was shared later in the week, leading to a lot of additional coverage for the game. Tomb Raider is getting a very decent amount of coverage, but maybe not to the extent I would have expected for the franchise. Overall, Square Enix did incredibly well (and that’s without being able to properly track Just Cause 3). Not sure how much more coverage they got through this though – a lot of their coverage was supported by console makers conferences (FF7 with Sony and Tomb Raider with Microsoft). It is fascinating to see the two publishers that aren’t traditionally seen hosting an E3 conference performing so well in comparison to EA and Ubisoft. I am pretty sure the devil is in the details, and the fact they elected to have a conference this year of all years was also driven by the strength of their announcements. Nonetheless, I wouldn’t have predicted such an outcome. This segment is a bit of a stretch as they aren’t many mobile titles that are part of the E3 line-ups, but it is the opportunity for me to make a point that I already discussing on the Goat Simulator case study. Fallout Shelter (Bethesda) – a management game, set in the Fallout universe, revealed at the conference and available to all at the same time. The Elder Scrolls Legends (Bethesda) – a CCG set in Tamriel, the universe of The Elder Scrolls series. Revealed at the conference, it will be available on iPad and PC but no release date for now. Lara Croft Go (Square Enix) – a turn-based puzzle adventure game, based on the Tomb Raider franchise. Announced at the conference, nothing specific on devices required and no release date announced yet. Minions Paradise (EA) – a management game, set in the Despicable Me universe. I am a bit confused on the whole announcement, trying to do some quick fact checks, it seems the app is already on the different stores, since end of April, but the conference presented it as an upcoming game, the host even stating “later this year”. So, go figure. Not sure it would have made a massive difference for the media present. Star Wars Galaxy of Heroes (EA) – a CCG set in the Star Wars universe. Announced at the EA conference, no release dates and no devices specified. Kingdom Hearts Unchained Key (Square Enix) – an adventure game (I think) set in the Kingdom Hearts universe (now, that’s the easy way out for me to avoid explaining that setting). Announced at the Square Enix press conference, with no release date. I don’t understand how the Elder Scrolls CCG got so well covered. It might be the brand; it might be the fact it was announced as coming to PC; it might be because Sunday was a pretty boring day in LA. Minions Paradise had a whole part of the EA conference presentation dedicated to itself. With a trailer followed by a gameplay demo. Nobody cared. Planning your communication for your mobile title like a console or a PC game seems like a bad idea. But not as bad an idea as just announcing “a Star Wars CCG with all the characters of the franchise you love”. I don’t think you can make it sound more generic and bland. At least, the Elder Scrolls CCG had a trailer of sort. Lara Croft Go was very well covered all things considered. I suspect Hitman Go and the relatively good feedback it received helped, along with a peek at the art direction and the game style. Nobody cared about Kingdom Hearts Unchained Key, despite providing a (cryptic, I admit) gameplay video. Announcing your mobile game as it becomes available seems like a good idea. The brand is a multiplier if you have one. American Truck Simulator (Excalibur Publishing) – announced during the PC games conference. A simulator where you drive trucks in America. Beyond Eyes (Team17) – announced during the Xbox conference and featured during the PC games conference. A game where you play as a blind girl named Rae in search for her missing cat. Crossing Souls (Devolver) – featured during the Sony conference. An action-adventure game in pixel art and with a goonies vibe to it. Cuphead (Studio MDHR) – featured during the Xbox conference (and revealed last year IIRC). A run and gun Platform game drawn in the style of 1930s cartoons. Also, my personal favourite concept (along with SUPERHOT). Mother Russia Bleeds (Devolver) – featured during the Sony conference. An ultra violent Beat ‘Em Up game set in an alternate 1980s USSR. No Man’s Sky (Hello games) – featured during the Sony conference and during the PC games conference. A science-fiction game set in an infinite procedurally generated galaxy. Unravel (EA) – announced during the EA press conference. A physically based platformer with a character made of yarn. 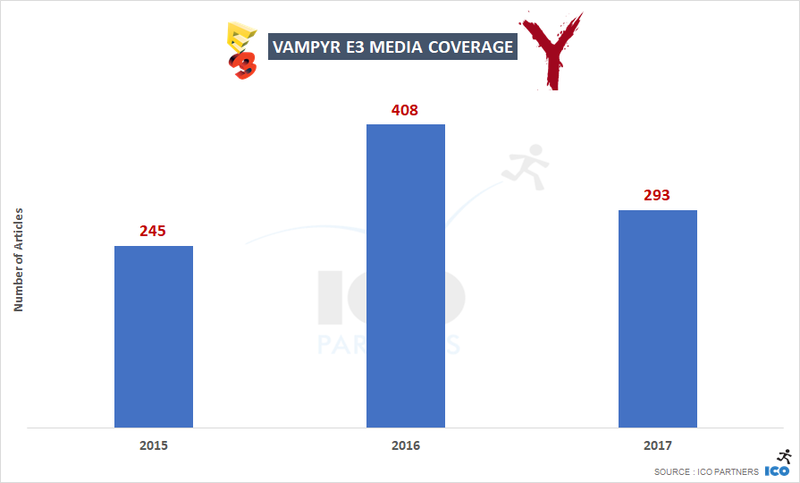 Vampyr (Focus Interactive) – not featured during any of the high profile conference but presented during the show. An Action RPG set in early 20th Century England. With the selection I tried to have games with different profiles, that were presented through different medium during the event and with interesting comparison points. Crossing Souls and Mother Russia Bleeds are both published by Devolver, they both got the same visibility during the Sony press conference and they were both hands on at the show (from what I could gather). Mother Russia Bleeds also released a trailer later in the week. 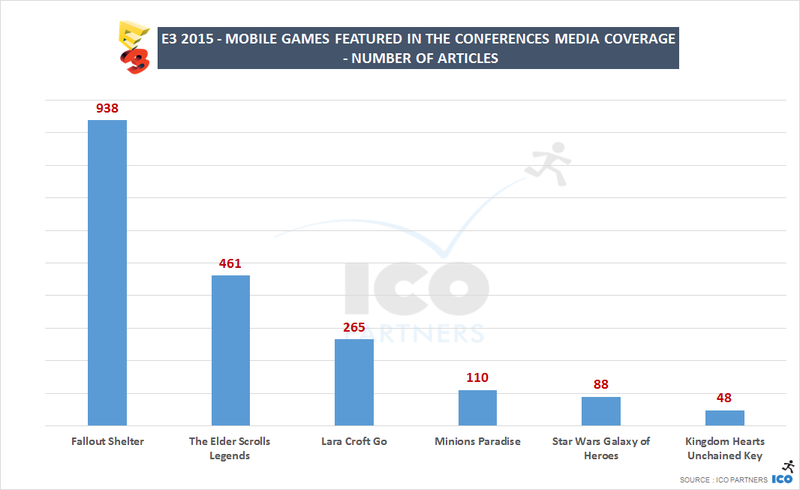 Ignoring the media that trailer generated, Mother Russia was still getting more media coverage than Crossing Souls. The more immediately understandable gameplay, and the very graphic violence possibly making it an easier story to relay. Cuphead has received a lot of coverage, thanks to its very unique art direction. 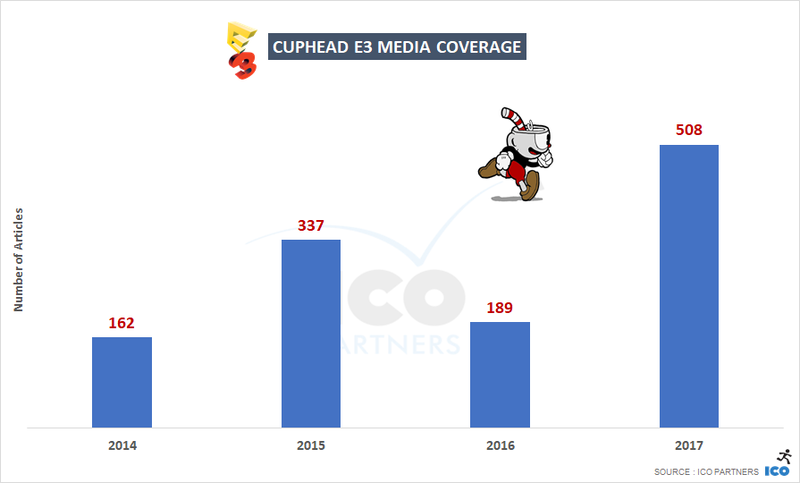 Considering that Beyond Eyes was featured at a similar level at the Xbox conference, and was featured again at the PC conference, Cuphead has been resonating better with the media (and makes for very shareable gifs). No Man’s Sky and Unravel are two games that have been incredibly well covered, while being outside of the AAA norm. No Man’s Sky has been announced in December 2013 and was already featured at E3 2014 (at the Sony conference). Coverage this year has progressed from last year (about 200 more articles). Unravel on the other hand is one of EA’s rare venture into games outside of the AAA formula, and with its reveal garnered almost as much coverage as FIFA 16. What made those two games perform so well? With No Man’s Sky, there is no doubt since its announcement that there is a strong following for the game and media is following suit. The details are quite rare and the E3 demo, while short, illustrated elements of the game never shown before. Unravel on the other hand was an announcement (more case studies on those to come), garnering extra attention thanks to this, and the incredibly emotional designer that presented the character on stage (a real doll made out of yarn) probably resonated well with the audience, while being at odds with the usually dry and corporate image that people have of EA. Vampyr finally is very interesting. For not being featured at any of the conference, this game made by Remember Me and Life is Strange developer Don’t Nod, was relatively well covered with its presence at E3, illustrating that the press conference are not necessarily the end all solution for a decent media presence from your E3 show. I have tried to keep the size of the article under a manageable size. There are more that could be dug from the data gathered (and I might do some follow ups), but I hope this gives a good view of last week’s E3 and the media outcome from the different announcements. There is no doubt in my mind that Bethesda is the clear “winner” of this E3. They brilliantly managed the event (from a media presence perspective at least) and I will be very curious to see next year who will try to get the Sunday conference spot. Prior to the event, I was very skeptical about Bethesda decision to do a conference at E3. Those conferences are expensive to set up and a massive burden on your teams to organise properly. I also tend to question the wisdom to share the limelight with your competition during the same week. Sony’s Playstation Experience was a great illustration of how running your own media event could benefit you in a great (better?) way than a shared global event. With Bethesda running Quakecon, I was thinking they would be diluting their effort in an event where it would difficult for them to shine. I was wrong – they did great. Which makes me wonder if the others were not wrong in sharing their audience with them this time around. http://icopartners.com/newblog/wp-content/uploads/2015/06/e3_2015_06.png 256 710 Thomas BIDAUX http://icopartners.com/newblog/wp-content/uploads/2017/08/ICO_logo_022.png Thomas BIDAUX2015-06-23 13:46:302016-12-04 22:29:00E3 2015 Media Coverage Analysis - aka "Who won the E3 media battle?"